Drone! Drone! Drone! Pilotless Airplane! 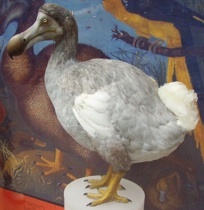 The January 22 issue of The New Yorker featured an article on the dodo, the large bird that became extinct around 1690. Its only habitat was the island of Mauritius, on which no human beings ever lived until the Dutch landed in 1590. It therefore took just one century of carelessness, and wee bit of malice, to wipe the species out. "Nor were they afraid of us," a contemporary wrote, "but just remained sitting, allowing us to beat them to death." The New Yorker article mostly concerns the history of dodo skeletons and the men who love them. But just as with most pieces in that magazine, other stories come rushing in once the door is left open. Well-meaning scientists are caught up in post-colonial cultural politics. Local politicians argue that the dodo's extinction was the best thing to ever happen to the Mauritius tourist trade. A lone, obsessive amateur tries to redirect the wide world's attention toward his curious little plot of ground. Alan Grihault, a retired teacher ... was surprised to learn that there was no standard glossy dodo book ... He began to gather material for one. He, too, found his way to the Mare aux Songes [a site with many underground dodo skeletons] and, in his mind, became the site's unofficial caretaker. "It was my place, a tranquil place," Grihault said ... [His wife] told me that her husband's dodo interest "sometimes gets to be a bit too much. Only two of us at home, so I hear everything, and sometimes twice, when he explains it to friends. Luckily I have the ability to switch off." And believe me, my wife identifies with this story, too. She and I both immediately recognized that Frank Cloutier and the Victoria Cafe Orchestra are like this for me — they are my dodo. After my hundreds of research hours and all the conclusions I've drawn, my most pressing conclusion that almost nothing is known about virtually everything — certainly these old musicians remain almost wholly ignored. I would have guessed, for example, that there would be several people in the United States working on each and every performer on Harry Smith's Anthology of American Folk Music. There isn't. When I bought the Anthology in 1997, the authoritative heft of the thing left me with the sense that there was little more to say. Surely, the Smithsonian must be delivering to us the limits of what is knowable, particularly given all those citations to scholarly journals. That's really why it took me nine years to finally try a little research on my own. But when I did, I was stunned to realize that nobody had bothered to do even the laziest, most casual investigation. Even after discovering a second researcher interested in Cloutier and the Victoria, I still find that ... well, I'm it. I'm the world's leading expert. Mountains of undiscovered material are waiting to be unearthed about an infinite variety of the past's important people and events. One reason for all this ignorance may be we've been tricked into thinking it's been researched. We picture Sherlock Holmes, with the hat and the pipe, or we Google up all sorts of interesing sites, and we think everything's been sorted out already. Well, it hasn't. Maybe this sad, universal forgetfulness is due to everybody trying to make a living and reproduce themselves. Who's got the time? More likely, I think it's just a rare personality trait, to want to know everything that is knowable about one thing. Minnesota Public Radio recently broadcast an interview with the author of an illustrated biography of Django Reinhardt. You can almost hear MPR reporter Tom Crann struggling to understand how someone can focus on one idea — one story — for most of his life. He seems to ask Michael Dregni the same sort of question, over and over, again and again, finding new ways to ask it until he finally blurts out, "Why do you care about him so much?" It could easily be my imagination, but what I hear is a reporter — someone who tells at least one new story every day — struggling to come to terms with why someone would choose to know everything about one subject. Dregni is very gracious in his response, but I want him to just say, "Look, Crann. Django's my dodo, OK?" Editor's Note: Today was the coldest day in three years here in Minnesota. And you wonder why I chose February to sit behind my computer and try to write one post every stinking day all month long. This is the sixth installment. Do you hear those helicopters?